Beautiful renovated Californian Bungalow in quiet heritage area with many hand-made leadlight windows. Close to the city, public transport, fantastic local cafes restaurants. NOTE: the base rate quoted is for a single person or couple using one bedroom and bathroom, if two singles want to use both bedrooms/bathrooms then please book for three. We have a high security deposit due to the leadlight windows, this is normally refunded within 48 hours of leaving and the property being checked. Same day bookings can be accommodated however you will need to message/inquire to check. Fully equipped kitchen complete with fridge/freezer, oven, cooktop, dishwasher and front loader washing machine and featuring a fully leadlighted door. Own door for access and private side area complete with clothes line for drying. This is your own space to use however as we live on site we are available to answer questions or assist if required. There are two small dogs that live at the rear of the property which you will have no interaction with and one old cat that lives outside and is not often seen. Newport is a quiet suburb with only one through destination being Williamstown so not a great deal of traffic. Elphin St is a peaceful street with a mixture of early Melbourne architecture, often renovated, along with a mix of properties through the decades. There are parks and great walks nearby along with some awesome local restaurants and cafes. Newport Park and the Yarra river are pretty much at the end of the street and you can walk down to Williamstown along the Strand for shopping, meals and attractions. Very well situated for trains and buses with Newport station being at the end of the street. As this station is the junction for trains to Werribee and Williamstown there is always a ready supply of trains heading to those destinations as well as the city. Buses also leave from next to the station to many destinations including Altona Gate shopping centre. Access to the Westgate Freeway is 5 minutes down the road with alternate routes into the city also available. A nice way to get into the centre of Melbourne is via the Williamstown Ferry service which travels up the Yarra under the Westgate bridge and into Berth 1 at Southgate next to the Elizabeth St walk Bridge. House Rules, please read and understand these Before Booking! ROOMS Base listing price is for two people (couple) using one bedroom and one bathroom, if two people (singles) are booking and want to use both of the bedrooms and bathrooms then please book for three. CHILDREN If your booking includes children please be aware that this property may not be suitable and you must check prior to booking. As mentioned there is a cot available for younger children. BEDDING The maximum number of people/beds is 4 and the bedding configuration is 1 queen sized bed, 2 single beds. NOISE You have your own space however there is a shared wall between the living area and our space which does mean there will be some sound travelling between. There are to be no parties or loud gatherings as we live on site. Arrival time is normally from 2pm and departure time is by 10am, these may be flexible however you must arrange first. SMOKING This is a NO SMOKING property from the front gate, please do not book if this rule does not suit. 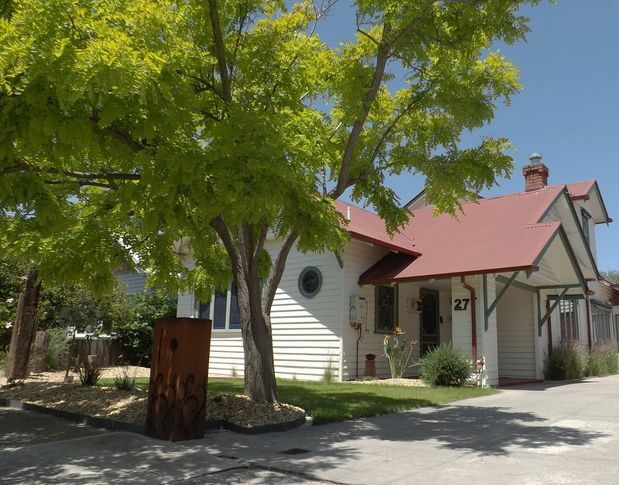 Lovely house in charming Melbourne suburb. We had a 14 days stay at Elphin Str 27 in a most well kept clean house living up to all our expectations. 2 bedrooms with separate bathroom facilities suited our needs with 2 families most nicely. Kitchen is equipped with all modern facilities and the cosy living room has a large moderne TV and a very good air conditioner which kept is well tempered in the Australian summer nights. Elphin Str is located in short walking distance to the local train station taking you to central Melbourne within 20-25 min. I am more than happy to recommend this accommodation to everyone in for a visit to Melbourne. A beautifully kept home. We will be back. So handy to everything. This charming and friendly property ticked all the boxes for us... it was a delightful place that will be on our list to return to on our next visit to see our family in Melbourne. The house is immaculate and amenities are wonderful but best of all we felt safe where we were. More than a motel. Thank you Noel for a great stay. Lovely and homey. Our second time at Leadlight Haven and it’s still good to stay there. Leadlight Haven is a lovely converted Californian bungalow in Newport. It’s close to Williamstown and access to the city is easy with a short walk to the Newport train station. Good for families.